Malarkey had been involved in a car accident at the age of six, and was in a coma for two months. His book, published by Tyndale in 2010 and co-written with his father, claims that he died and went to heaven, having encounters with angels and ultimately meeting Jesus. The book reached bestseller status, and a documentary was also released about Malarkey’s story. Christian reviewers gave the book high marks. But Malarkey’s admission that the story was fabricated isn’t necessarily new. Last spring, Malarkey’s mother wrote in a blog post that she had concerns about the book’s continued proliferation as her son had confessed that the book was unbiblical. Malarkey and her husband have since divorced following the publishing of the book. “Tyndale has decided to take the book and related ancillary products out of print,” Todd Starowitz, public relations director for Tyndale House told the Washington Post. Lifeway Christian Stores, one of the nation’s largest Christian retail chains, also announced Thursday that it will pull the book from its shelves and send its copies back to Tyndale. 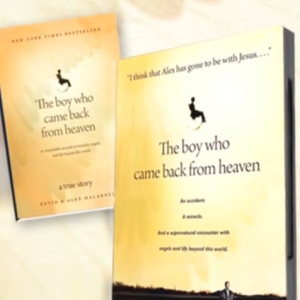 “LifeWay was informed this week that Alex Malarkey has retracted his testimony about visiting heaven as told in the book ‘The Boy Who Came Back from Heaven.’ Therefore, we are returning to the publisher the few copies we have in our stores,” it wrote in a statement.